1. 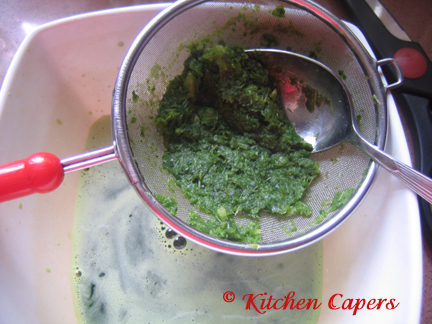 Add water to spinach and puree till it turn liquid. 3. The juice should add up to 110ml. If not, just add enough water to make up 110ml. 4. Mix juice and rest of ingredients to form a dough. 6. 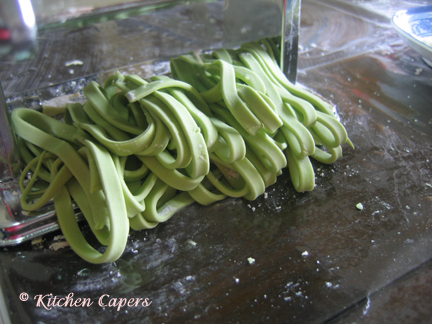 Run it thru the middle section cutter and the noodle will come out at the bottom of the machine. 7. Pick it up as a bunch and place it on the table. 8. add 1 tbsp of tapioca flour on top. 9. 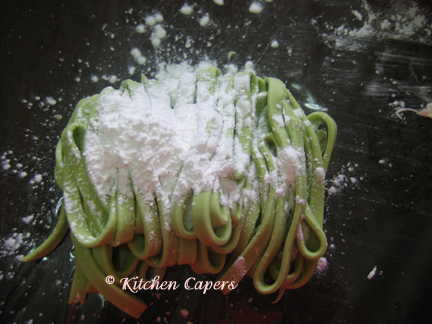 Use both hands to toss the noodles to mix with the flour. 11. If you want instant noodles size, then run it thru the 3rd section as shown. 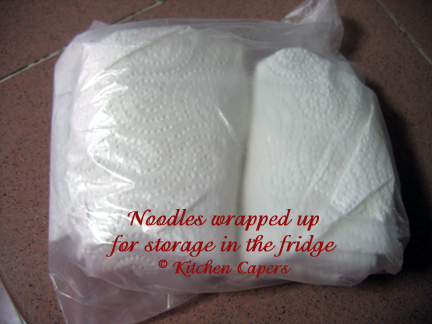 I find the best way to store the delicate noodles is to wrap it in a paper towel, then in a plastic bag. 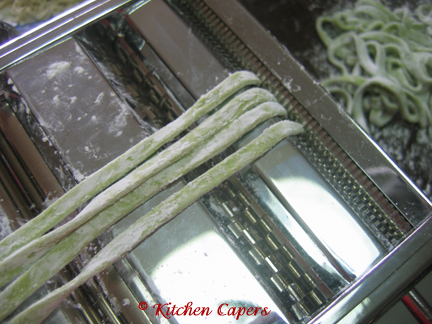 To prevent water droplets penetrating the noodles making it wet and sticky. Gina, what spinach did you use? What do you call it in Chinese? Coz if I go market & ask for spinach, they might not know what it is. 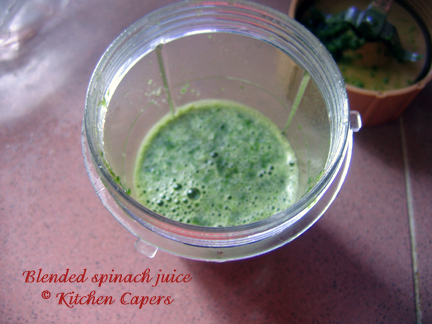 Can you please post a photo whenever you buy this type of spinach again? Gina, since I'm going to the market, what's the name of this spinach in Chinese? i think the cantonese name is Yin choy..as someone once said it is. u know the vegetable they use for frying with Abalone? Oh... I know yin choy. The one that you can do the 'quick-boil' soup. Is this the one? 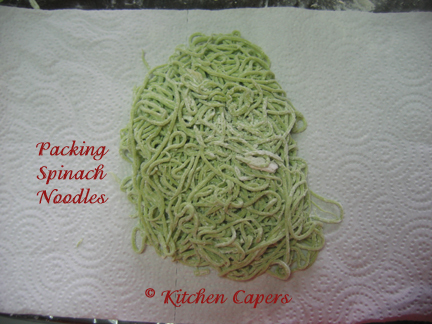 Hi Alannia, from the pic, it does not look like spinach but another type of veg. Spinach in teochew is "puay-leng". As Gina mentioned, we normally boil/fry it and topped with abalone slices (served in resturants too) or fry with minced meat. I'm not sure about the vege served together with abalone in restaurants coz never had it in restaurants. Does anyone know whether it's called bayam in Malay or does anyone have a picture? ya,alyssa you are right ! 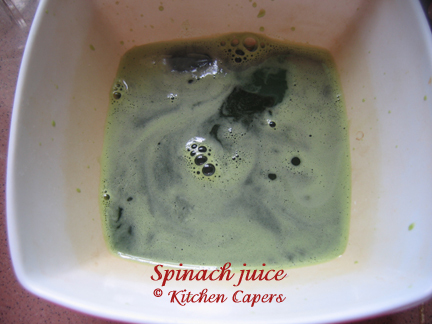 spinach is called "bo-chye" in mandarin. Thanks. Alannia, spinach is bayam, you're right. Oh.... now I understand. Yin choy (bayam) is local spinach & bo cai is western spinach. Thanks, Alyssa, JC & Sarah. I have always wondered why some people say bayam is spinach while others say bo cai is spinach. Now I know there are different species of spinach. I have some questions. Hope you can help. 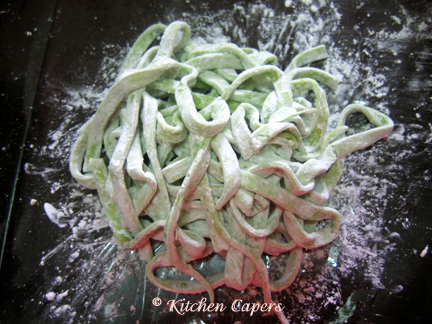 1) Do you knead the dough till smooth before running through the smooth rollers? I didn't, end up have to put through the rollers many many times before they become smooth. 2) After running through the middle cutter, the strands didn't separate out. I had to separate them one by one after dusting with flour. Could this be the cutter problem? Other than that, the pasta was good. Maybe because I didn't make it thinner, so its a bit chewy after cooking. 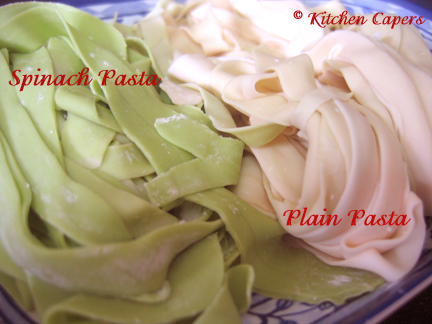 But we like it 'al dente' Thanks for recipe Gina. 1) no..just as it forms into a dough. I just break/cut into smaller portions and run thru the machine. You may need to adjust the thickness to wider for the first 2 to 3 runs. 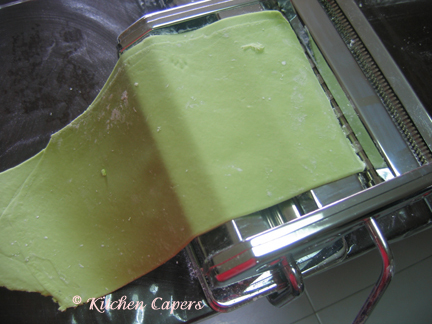 Dust with tapioca flour to prevent it from sticking to the blade/roller. Then when it comes out smooth, you can turn the dial to slightly thinner. Then run it thru again. Lastly, dust with flour before running it thru the cutters. 2) it sticks together because its too moist/wet/soft. Dust with flour before you run it thru the cutters. 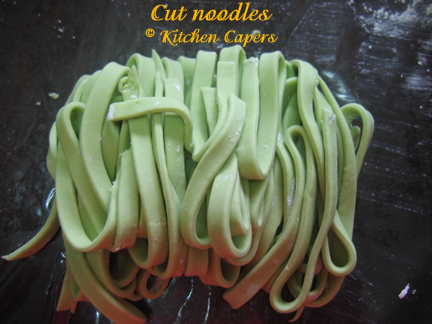 Thus you see me making so many types of noodles every other day. You need to practice and get use to how it works. After 2 to 3 days of trying, you'll get the hang of it..and it will be very fun and easy to use. Gina, thanks so much for your tips . I divided into two portions and run through the rollers. Next time I'll divide into smaller portions and dust with more flour before cutting. Yup, I hope I get to practise frequently, usually only cook main meals on weekends coz we get off work quite late and if I cook, my hubby would be starving. Angie, welcome to pasta machine club I love pasta al dente too! Giselle, do I forsee your dream becoming a green reality very soon?